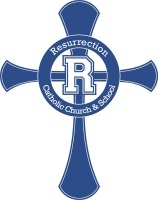 Resurrection Youth Ministries seeks to connect Middle School and High School aged youth to Christ through catechesis, prayer, service, and community building, challenging them to live out their discipleship. Teens are always welcome to join us for any events. Regular members should fill out a Faith Formation Registration form so that the teens will receive mailings and information on upcoming events. Different forms are required to sign up for special events. High School and Middle School teens meet on Wednesday evenings during LiFFe Nights for our weekly gatherings. All teens are encouraged to join us to have fun, make friends, and become living disciples!!! We gather together for snack, then separate for our evening events. Kick Off fun...Scavenger hunt madness! Our Peer Ministry Celebration in Orlando. What a great way to spend a day off from school...serving at Agape Food Bank! Bad Habit Bonfire and s'mores...with some fly swatter hockey! Friends and a Flick...having fun at the beginning of Thanksgiving break! Backwards Day at CIA... I mean AIC! Setting up for the Middle School retreat! Journey of LiFFe meets on Wednesday evenings from 6:15-7:45 p.m.! We meet in the Fr. Sheedy Center for activities that help us to learn more about and live out our faith. All 6th-8th graders are welcome! RCS students are welcome to join us! Resurrection Youth Ministry would like to thank our major sponsors who make scholarships possible for all our major events, like retreats, Catholic HEART Workcamp, Steubenville Florida Conference, and the National Catholic Youth Conference and other leadership training opportunities. Your faithfulness and generosity helps our ministry accomplish our goal to connect teens and their families with Christ and His church. What happened this past summer? Catholic HEART was an awesome week of service in Melbourne Florida! Here are some highlights! Steubenville Florida Conference was a beautiful, faith filled weekend! Thank you for all your prayers! Middle School Workcamp was a fun week of service! What’s available for Middle School students? Our middle school program meets on Wednesday nights for Journey of LiFFe, from 6:15-7:45 p.m. This is where teens come together for weekly community building activities that will continue to develop their Catholic faith. We learn in small groups and grow spiritually together in our prayer life as we experience opportunities of praise & worship and participate in prayer circles. We respond to the needs of others by discovering the call to justice and service! Service nights will be a great opportunity for students to learn more about what they can do to for others as a reflection of Christ. We have faith-filled retreats, social events, and service projects. All 6th through 8th graders (parish school, public school, home school, parishioners, friends of parishioners) are welcome at ALL Youth Ministry events. What’s available for High School students? CIA (Catholics in Action/Catolicos en Accion) meets on Sundays from 2-4:30 p.m. in the Fr. Sheedy Center We begin with lunch and socializing, then move into learning, service and prayer experiences to help us grow in our faith and live out our discipleship. Holy Grounds Coffee House meets on Wednesdays from 6:15-7:45 p.m. in the Art Room of the Middle School. Sit around and have coffee and tea while studying the Bible and talking about the latest happenings in your life and in the world, and how God fits in to the whole picture! In addition, we have service days in our local community, local retreats, a camping retreat, diocesan events, the Steubenville Florida Catholic Conference and Catholic HEART Workcamp summer mission trip. All high school aged teens are encouraged to attend as many activities as possible! Do you have a Spanish Youth Group? Si! Parroquia de la Resurrección. Estaremos realizando nuestras reuniones en la escuela todos los domingos a las 2:00 pm hasta las 4:30 pm. No faltas! El Señor te espera para seguir realizando su gran obra y cuenta contigo, JOVEN.